Like many, I cut my RPG teeth on 3e (and later 3.5). When the first Pathfinder was released I was all over it, I had the beta book, the bestiary previews and scooped up the first adventure path like it was water in a desert. For me (and others) Pathfinder was the ONLY WAY to continue gaming the "right way" after 4e changed the format so much. I fell quickly away from Pathfinder, only taking part in a few games near its beginning that were a weird mishmash of 3, 3.5, and Pathfinder's "streamlining". I found the OSR and aside from some publication development and lore never really looked at Pathfinder again. That was until a few months ago when the playtest for the second edition was announced (PDF available for free on August 2nd, and physical pre-orders available through May 1st). I became excited again, I enjoyed the art and lore of Pathfinder. I liked how the world gave a reason for all the adventurers (The Pathfinder Society) instead of just allowing a bunch of murder-hobos on the loose. With this in mind, I decided to keep an eye out, following Paizo's blog and pre-ordering the physical copy of the playtest. Now, though I am a little worried. Given what I know about printing, proofing, and all that other stuff from my own releases I am left to assume that given the August 2nd date Pathfinder 2.0 is almost in its first run ready state. This has me concerned in large part due to a post on Halflings of all things. Now there are months before release but the one thing that worries me is that they seemingly have removed dice or points from character creation. With everyone starting at base 10 ability scores and adding or subtracting points from those scores based on level and ancestry. To me, this gets very far from a d20 descendent game, placing it much more in line with a story based system or one of the ill-fated "forge" games that I hear whispered in dark corners of gaming pubs. My hope is that this is an option and the player can still build using dice or point-buy, however, from what the next paragraph says I doubt it. 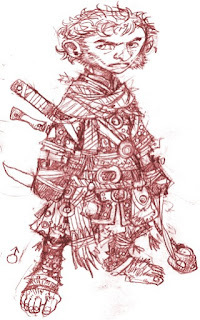 At 1st level and as they level up, halflings can pick up halfling ancestry feats that take advantage of their size, their gumption, and their fabled luck. Distracting Shadows lets them sneak around by using larger creatures as cover. They might also pick up Plucky to overcome fear and other detriments to their emotions. They can take Titan Slinger to get a bonus to damage when using their slings against Large or larger creatures. This bonus increases on critical hits, even before being doubled! Additionally, the sling is now a more formidable weapon than in Pathfinder First Edition—we've both increased its damage and done away with the difference in damage die size between Small and Medium creatures. A halfling with a sling can be pretty dangerous! While I could be wrong this description rings closer in my mind to skill tree map popular in later day MMO games and suggests more of a mechanical building of a character than an organic one that can at least be somewhat found in older d20 based systems. In the end though I suppose it is a waiting game. I've been thinking the same thing, what put me off Pathfinder already is that it feels like you have to plan at least 3 levels ahead, at least if you want to be remotely optimal. Now they're pushing that dial up to 11.